You probably already know that you need a diet where your Omega-3 fatty acids and your Omega-6 fatty acids are balanced; Omega-6 fatty acids help your body undertake the process of inflammation, which is necessary for self-maintenance (getting rid of damaged cells), Omega-3 fatty acids add the balance necessary to keep inflammation from becoming chronic. Evening Primrose Oil contains Gamma-Linoleic acid, an Omega-6 essential fatty acid that is rarely found in food sources and usually made by the body. Unfortunately, if we arenâ€™t eating a balanced diet, if our bodies are stressed, sick, or aged, it may not be able to produce enough of this essential fatty acid. Why is Gamma-Linoleic acid so special? Unlike most Omega-6 fatty acids, Gamma-Linoleic acid (GLA) may actually help to reduce inflammation, as it can be converted into DGLA (Dihomo-Gamma-Linoleic Acid, an anti-inflammatory Omega-6 fatty acid) with the proper nutrients (including magnesium, zinc, and Vitamins that can usually be found in a good multi-vitamin). 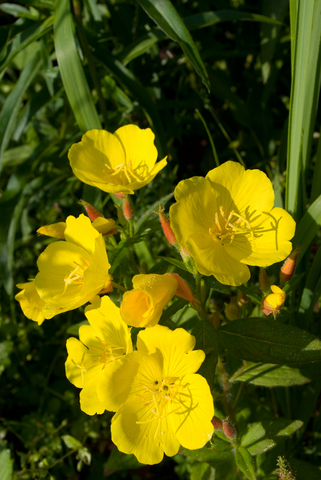 Traditionally, Evening Primrose Oil has been used on eczema (and subsequently on inflammation in general), as well as to ease various womenâ€™s health issues, ranging from premenstrual symptoms to menopause (it can, however, induce labor, and so should not be taken while pregnant). It plays a role in growing and stimulating healthy hair and skin. Helps keep your bones strong, reducing and sometimes reversing the effects of Osteoporosis (Thereâ€™s a connection between insufficient consumption of essential fatty acids and Osteoporosis). It helps to regulate metabolism. It plays a role in reproductive maintenance. It may help reduce nerve pain caused by diabetes. It may help reduce allergies–studies have found people with insufficient amounts of GLA also have allergies (it could also be that people with allergies have trouble making GLA, either way it seems wise to add GLA to your diet). It may help to reduce blood pressure and sharp leg pains due to high blood pressure. It may work synergistically with several drugs, improving the efficacy of one type of antibiotic, reducing side-effects of certain drugs, etc. For this reason, Do Not Take Evening Primrose Oil without Consulting a Doctor About Other Medications You May Be Taking, and Tell Your Doctor if you are taking Evening Primrose Oil before he prescribes anything, or before surgery. While overall itâ€™s good that it improves other drugs, it may improve them too much, for example, when paired with blood thinning medication (including Aspirin, which you may not be using for blood thinning) it may increase the risk of bleeding. Despite all of Evening Primrose Oilâ€™s benefits, itâ€™s important to first make sure that your eating a diet that balances Omega-3 and Omega-6 fatty acids before adding more Omega-6 (most people get too much Omega-6 due to Americaâ€™s high-fat diet). For tips on achieving balance, Click Here, or consider supplementing with Omega-3 fatty acids and a multivitamin (to achieve proper conversions).